Chestnut Street at West 26th Street, City of Erie, Pennsylvania, U.S.A. 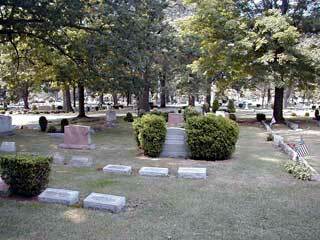 The Erie Cemetery is a one of the oldest and largest cemetery in the City of Erie. I currently has nearly 50,000 internments in a 14 city-block area and still growing. It is located between West 26th Street and West 19th Street, with its main entrance on Chestnut Street. 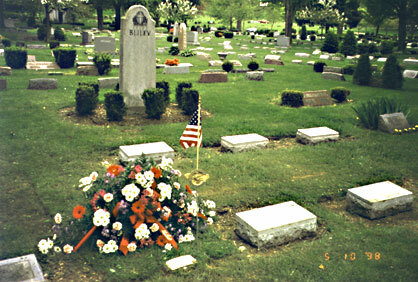 The Bliley Family plot is located in the East side of the center section of the Cemetery. Headstone to the right of Josephine Oldham; just out of this view. 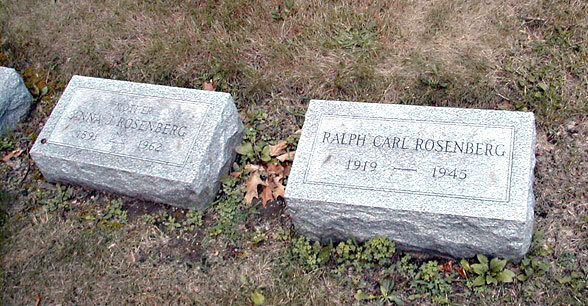 The Rosenberg-Kendall is about 60 feet West of the Bliley Family plot. The plot stone is between the two bushes in the center of the photo. These are relatives from my mother's side of the family. Click on the photo icon for a close-up of the headstones. Typically, 80 kilobytes in size.